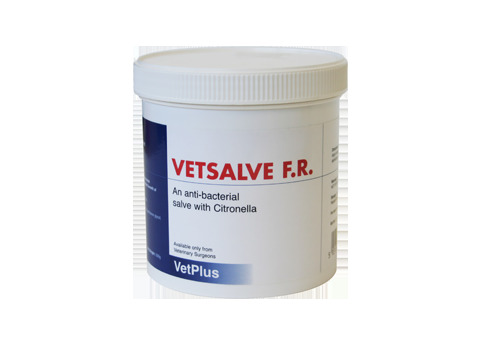 VetPlus VetSalve F.R. for Farm Animals is an essential summer product which is a natural topical application for the maintenance and integrity of healthy skin. Its anti-bacterial properties help to promote healing of minor cuts and abrasions. The inclusion of a natural fly repellant helps to prevent wound contamination. It is a tried and tested salve that has been proven to work for up to 72 hours. Chloroxylenol, Citronella Oil, White Petroleum Jelly, Polythylene Glycol. Apply liberally to affected area and re-apply until condition is resolved. Below are some recent questions we've received regarding VetPlus VetSalve F.R. for Farm Animals, including answers from our team. My goats seem to have itchy feet , especially on their pads at the back of there legs . They have scabs too ! I have tried purple spray , loused and mites them and fusiderm them , but still have a problem . What do you sugest ? Clean dry ground is best for their feet. If the ground tends to be moist or dirty, you should try and change this. Some clean, dry concrete or paving slabs helps to wear the feet naturally too. In addition to these measures, this product is a reasonable one to try and it might well help, though it is not clear to me exactly what the underlying cause will be. If the problem does not clear up, you should get a vet to have a look at them for you.